You’ve spent time and resources developing your brand, creating campaigns and crafting marketing content to reach your audience, and now you are ready to tap into global markets or multilingual markets here at home. To do this you must translate and localize your marketing content, but how do you ensure that your brand voice is accurately rendered for different language markets? There is a lot that goes into marketing messages—both explicit and implied—that must be conveyed. 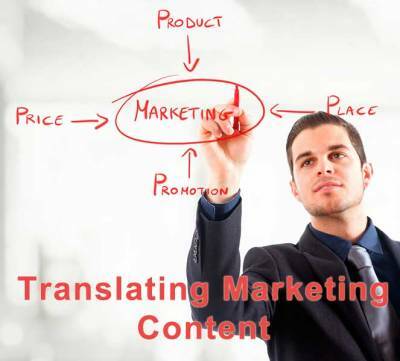 Keep reading for six key considerations when translating marketing content. The first thing to consider when translating your marketing content is who your marketing messages are targeting. Are you trying to reach IT managers, teenage girls or the average guy on the street? There are differences between targeting a technical audience and targeting a general consumer audience. You would use different language to appeal to each of these audiences in a different way. A good rule of thumb is to always be specific with your translation team about who your audience is no matter what you need translated. When translating marketing content, you want to pick translators who are not only subject matter experts, but who also have excellent native language writing skills. Not everyone writes the same and having background knowledge of a subject does not guarantee that you can write about it well (as testified by anyone who has had to slog through a poorly written technical manual). While subject matter expertise is important, for marketing material you also want translators who are compelling writers. You want a skilled native language copywriter who takes time to think about the nuances of your marketing messages and how best to communicate them in the target language. Ideally, all translators would be that good, but they are not, so it is important to be selective with your translation providers. You may even ask for references or sample work before making your final choice of translation provider. When it comes to translating marketing content, giving your translation team reference materials to help them with translation is also very helpful. Offering brochures, web links, other translated materials or collateral helps your translation team stay consistent in style and terminology and sets your translation project up for success. It also gives translators a reference point when approaching how best to translate your content. If your marketing content involves translating more than a couple of pages, then you may consider creating a glossary and style guide. A pre-approved terminology glossary identifies language choices that a translator must use for each market and is an ideal initial starting point. Style guides also assist translators in their translation decision-making process. Style guides help with corporate branding and may include items such as intended brand perception, goals, grammar, punctuation, tone, brief vs. detailed descriptions, authoritative vs. conversational intent and audience. You may want to work with your professional translation provider to develop a glossary and style guide ahead of time to ensure your marketing content is translated the way you intend. Before translating marketing content for global audiences or other language groups you may want to perform a cultural assessment to have a better understanding of the target audience you are trying to reach. A good translation provider will offerglobal brand consulting and will recommend changes to your content based on your market. Images may have different meanings, and colors are interpreted differently based on one’s cultural background. You may want to change the images, concepts, idioms that won’t translate well or could even offend your target audience. An up-front cultural assessment can save your organization a lot of embarrassment that results from confusing or offensive localized marketing content. Sometimes straight translation is not enough, and you need transcreation services. It is much harder to translate for marketing content than it is for generic informational or technical content. Marketing writers often use figures of speech, idioms, cultural references and appeals to understood shared knowledge that may not fare well with direct translation. For example, even simple phrases like “Fortune 500” and “key employees” while understood in the United States do not always translate well conceptually (China is not familiar with the Fortune 500 and Russia does not have a concept for “key employees”). It is important to remember that when translating for marketing content, you want to move beyond a literal to a more conceptual translation. You want your translation team to think about what your content means and then how do they convey it. In this instance you want your marketing content to undergo transcreation rather than straight translation. Transcreation (sometimes called creative or adaptive translation) is developing your message for a specific target audience rather than just merely translating existing materials. A good transcreation feels like it was written in the target language in the first place and provides maximum impact for your marketing content. For more on Transcreation, please see our blog 5 Keys To Transcreation Success. Translating marketing content is vital when entering global markets and targeting different language groups at home. However, not all translation providers are the same. It is important when translating marketing content to consider your audience, your translation team, providing reference materials, creating a glossary and style guide, performing a cultural assessment and then perhaps opting for transcreation over straight translation. These six fundamentals will help you get the maximum impact out of your translated marketing content. What experiences have you had with translating marketing content? Have you experienced any gaffes due to errors stemming from literal versus conceptual translation? How do you approach translating your marketing content? Please share your thoughts in our comments section below. Also, if you have benefitted from this blog, please like and share it socially using the buttons above.